Mobile payment technologies have evolved through the years. They are driving commerce at a fast pace. With the global mobile payments market expected to grow to USD 721.4 billion by 2017, retailers as well as consumers are adopting digital payments than never before, thus the revolution of digital wallets has begun. Gone are the days when one had to use cash or cheque as a medium for payments. No more standing in the queue at banks or atm counters. Digital wallets are a recent entry into this list of payment methods. Billed as the future of real-world payment technologies, they are much faster and convenient to use as compared to the traditional methods. The whole digital wallet revolution started with NFC, but several companies are now exploring digital wallets that utilize technologies outside of - or as an additional option to - NFC, Wi-Fi, Bluetooth, or even QR codes are all being explored as possible options to replace NFC. Even though digital wallets are highly encrypted in storing consumer data, yet security remains a major obstacle to its adoption. Several companies play an important role in various electronic and mobile commerce products, from payments companies to social networks, gaming communities, internet search engines and telecom operators. All of these types of companies are handling and sharing information about your financial accounts and identity - so combating fraud, preserving your privacy and protecting your accounts is more important than ever. 1. Enable Passwords On Your Devices: Enable passwords on your phones, tablets, and other devices before they can be used. Use the benefits of additional layers of security provided by these devices. 2. Use Secure Network Connections:Always be aware of the kind of networks you are connected to. It's important to be connected only to those networks which you can trust. Avoid the use of public Wi-Fi networks. More secure WiFi connections require passwords and are easily identified as 'WPA or WPA2.' Highly-insecure WiFi is wide-open for anyone to connect to, and may be labeled as a 'WEP' connection. 3. Install Apps From Sources You Trust: Apps are not always what they appear to be. In fact, you could be getting more than you bargained for. A free game might not be just a game, but an app designed to illicitly collect personal data from you. Reading the user ratings and reviews can provide some clues about the integrity of the app. 4. Keep Your Private Stuff Private: Never share sensitive data with those you don't trust. This includes when you respond to email requests, phone inquiries or allow control to anyone you would not normally hand over a physical wallet to. Financial service providers and support staff will never ask for private information such as passwords or payment account numbers. 5. Keep Login Credential Secure: Avoid writing down information used to access the digital wallets in plain view or storing in an unprotected file. Easy access to them might result in the misuse of your data and credentials. 6. Create a Unique Password For Your Digital Wallet: Avoid using the same password you use for email or social networking sites. This increases the risk of unauthorized access. Instead, use an easily remembered, yet hard-to-guess password unique to your digital wallet. 7. Identify Who To Contact If There Are Issues, Before One Arises: Ensure that you understand the quickest way to resolve any issues that arise and who is responsible for any fraudulent activity on your account. Some common scenarios to consider your phone is lost or stolen, an individual card stored in the wallet is lost, your account has been or may have been hacked. These enlisted security tips are simple to follow and can save you from a huge monetary and data loss. 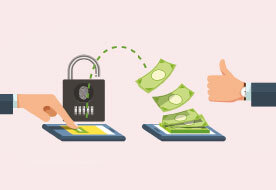 For organizations that use digital wallets should ensure the security of these wallets as the end users enter their confidential information to buy a product. At Appknox, we work with some of the top payment and digital wallet companies in making their mobile apps more secure and updating them to new vulnerabilities as they arise. If your business deals with the digital payments then you can register for a free security scan of the app that you are using.